We didn’t get where we are today by being average. Our unbiased approach, unmatched experience, and dedication to our customers has earned us a spot as one of the most respected, efficient, and knowledgable firms in the utility industry. In fact, our number one source of new business comes from customer referrals! Customer satisfaction is our top priority, and we’re glad it shows. Check out the testimonials below to see what our clients have to say about UMS! You don’t choose someone to provide a service; you choose a partner. It became apparent that UMS was going to be a partner that would provide to us that value we were seeking. The professionalism of the project managers and the employees of UMS was very good. They were very excited about the project, and their professionalism towards, not only our internal employees but the customers themselves, was very well respected. If I were asked about UMS, I would answer that they are very professional, very knowledgable staff. They are able to provide a service that is not biased with regards to equipment and meters, which helps us—and would help anyone—make a knowledgable decision and be able to look at the different options that are out there and the cost of each. 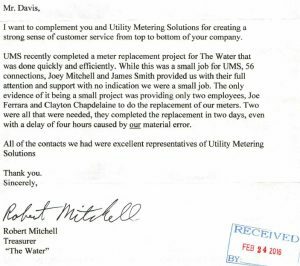 UMS recently completed a meter replacement project for The Water that was done quickly and efficiently. While this was a small job for UMS, 56 connections, Joey Mitchell and James Smith provided us with their full attention and support, with no indication we were a small job. UMS came in, and their focus was more on the audit as opposed to just selling the system . . . 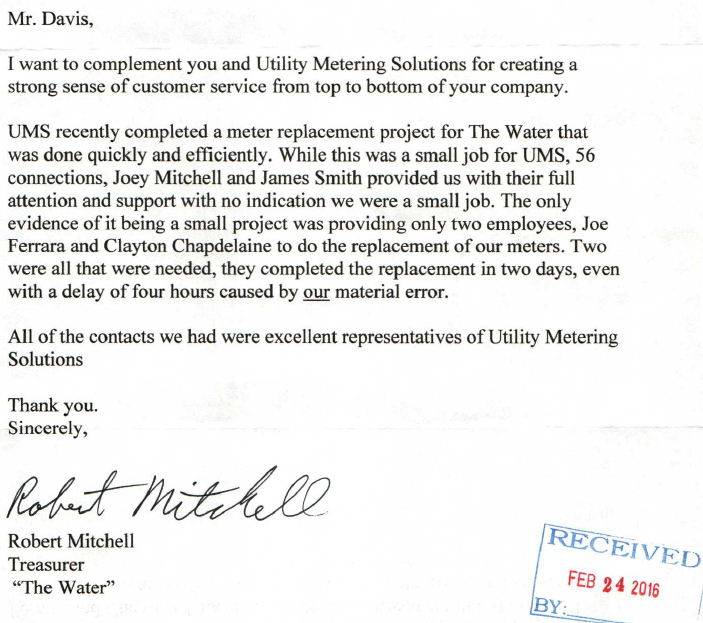 I like the fact that they took their time and did a critical sampling of those meters that they felt were reflective of the overall condition of our system . . . The audit part of the process really impressed me. Stay tuned! More customer success stories to come.